Sammy Santos takes over as IAF coordinator from Clare Amador. FNF Resident Representative Siegfried Herzog looks on. 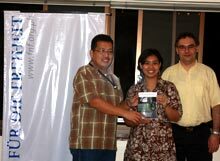 The Friedrich Naumann Foundation (FNF) Alumni Group welcomed 2008 with the launch of the International Academy for Leadership (IAF) annual directory on 27 February 2008 in Makati City. The Alumni Group is composed of individuals who have completed IAF leadership trainings in Europe. It serves as a network for the exchange of ideas and a resource for further learning. To lead the alumni’s activities for the year and to continue replicating the IAF seminars in the Philippines, the Group elected Sammy Santos, Senate print media director. “The FNF alumni must play a bigger part in spreading liberal solutions especially given the challenges our country is facing today,” Santos said. He promised a year of more activities and at least one IAF replication seminar in the province. The alumni capped off the evening by viewing the film The Call of the Entrepreneur. The movie dispels the criticism that businessmen are “greedy capitalists.” By discussing the lives of three different entrepreneurs, the film shows that business is a legitimate vocation that benefits society.